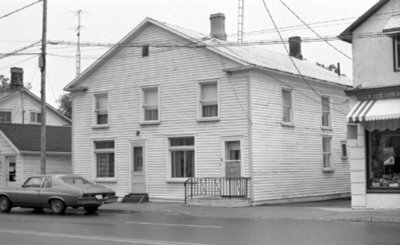 A black and white photograph of 57 Baldwin Street. This building was located at 57 Baldwin Street, Brooklin. It was built in 1855 as a Wesleyan Methodist Church on Winchester Road East and was moved after 1868 to 57 Baldwin Street and turned into Morley Ross's Store. 57 Baldwin Street, April 1976, Brian Winter. Whitby Archives A2013_004_029D.